Patty Lord. Photo by Lee Choo. Longtime staff member Patricia Lord has been appointed director of the Office of Admissions and Records. 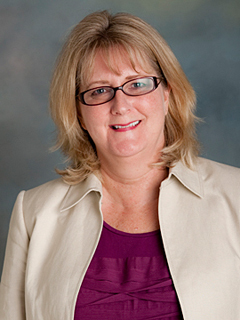 “Patty is both well qualified and respected in her field and has 25 years of progressively responsible experience in administrative and supervisory positions in admissions, student enrollment and registration at California State University, Northridge,” wrote Provost and Vice President for Academic Affairs Harry Hellenbrand, in an announcement emailed to the campus community. Lord fills the position left vacant by the retirement of interim director Suzy Babikan, who served in the position for one year. The position was previously held by Eric Forbes. Lord began her career at Cal State Northridge as a student information specialist working with students. She was promoted to records analyst and then coordinator of the schedule of classes, a position she maintained for 16 years. She worked as a supervisor and associate director of human resources and budget for admissions and records. Before her appointment as director, she worked as the interim registrar. Lord earned a bachelor’s degree in communication studies with a minor in psychology in 1997 and a master’s degree in educational administration in 2004 from Cal State Northridge.